The Allen County-Scottsville High School Patriot Band is scheduled to open the 2018 festival season September 8 at the South Central Kentucky Marching Band Classic at Glasgow High School. Band and color guard members have worked since the spring to create the show. Director Huff adds that the band has plenty of returning experience. Huff likes the overall “personality” of the 74-member band. The band will be under the field command of second-year drum major Nathaniel Stinson. “Nathaniel will be dressed in the full Mad Hatter costume.,” Huff pointed out. The Patriot Band has five festivals on the calendar prior to the Kentucky Music Educators Association’s West Regional Quarterfinals. Included in the schedule will be a first for the AC-SH band since Huff came to AC-S 22 years ago. The home festival will be on Saturday, September 15. The first band will perform at 3:45 with awards scheduled for 8 p.m. that evening. 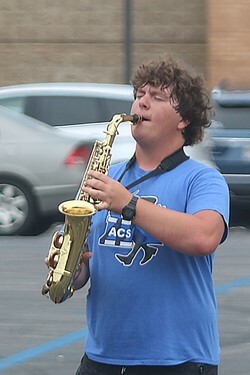 AC-S starts the season with the September 8 festival at Glasgow---an event which includes bands from Hart County, Barren County, Greenwood, and the host school. The Lindsey Wilson College Blue Raider band will also present an exhibition. The festival starts at 5:15 with AC-S slated to perform at 5:45. The remaining schedule includes competitions at Nelson County on September 22, Warren East on September 29, and Barren County on October 13. The band will then participate in the Kentucky Music Educators Association (KMEA) Class 3A West Regional Quarterfinals at Warren Central High School on October 20. If the band qualifies, the Patriots will move the KMEA Class 3A state semifinals on October 27. If the band finishes in the top four at the semifinals, the band will compete for the state championship in their class on the evening of October 27 at Kroger Stadium at the University of Kentucky. The season will conclude on November 3 with competition in the Mid-States Band Association Class 2A Championships in Miamisburg, Ohio. The marching Patriots will also present a glimpse of their festival show during pre-game activities at home football games. In addition to Huff, the band is under the direction of assistant band directors Chelly Stamps and Gina Huff, who serves as the band’s creative director and is responsible for the colorful visual effects incorporated into the show.